The Washington Spirit prevented Seattle midfielder Megan Rapinoe from kneeling during the national anthem by altering its pregame ceremonies rather than "subject our fans and friends to the disrespect we feel such an act would represent." The National Women’s Soccer League team moved up the anthem, playing it while the teams were off the field at the Maryland SoccerPlex on Wednesday. On Sunday before the Reign’s match in Chicago, Rapinoe knelt during the anthem in solidarity with Colin Kaepernick — the San Francisco quarterback who has refused to stand during the anthem to protest racial injustice and minority oppression. Rapinoe said at the time she planned to continue to kneel. “To willingly allow anyone to hijack this tradition that means so much to millions of Americans and so many of our own fans for any cause would effectively be just as disrespectful as doing it ourselves,” the Spirit said in the statement. 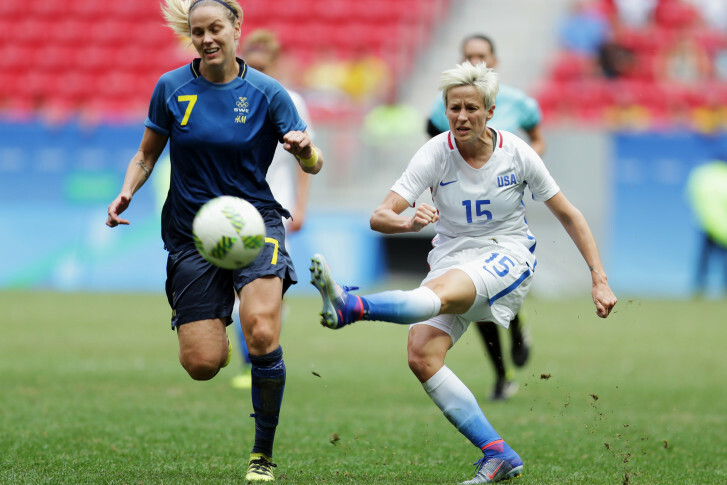 Following the match, Rapinoe said she was saddened by the Spirit’s move. “It was incredibly distasteful, four days before one of the worst tragedies in our country, to say I tried to hijack this event,” The Washington Post quoted Rapinoe as saying. The Spirit said team owner Bill Lynch is a veteran who has lost friends in overseas conflicts, as had his close friends. Kaepernick drew attention when he remained seated on the bench before a preseason game against Green Bay. Last Thursday night in San Diego, he and safety Eric Reid knelt during the anthem before a preseason game against the Chargers. On Sunday night, Rapinoe kneeled during the anthem before the match against the Chicago Red Stars, in what she called “a little nod’ to Kaepernick. “I think it’s actually pretty disgusting the way he was treated and the way that a lot of the media has covered it and made it about something that it absolutely isn’t. We need to have a more thoughtful, two-sided conversation about racial issues in this country,” Rapinoe told the website American Soccer Now afterward. The 31-year-old Rapinoe has been with the U.S. national team since 2006 and has played in two Women’s World Cups and two Olympics. She has played for Seattle since 2013. Rapinoe injured her knee last December during training and required surgery, but played in the Rio Games. The United States, which had won three straight gold medals in the sport, was eliminated in the quarterfinals by Sweden.